An S340 upgraded with VR amenities. The emergence of VR gaming has hardware and peripheral makers rethinking traditional designs. 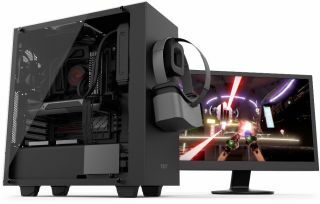 This is underscored by NZXT's new S340 Elite, essentially a modified version of the S340 with a larger side window, more USB ports to accommodate VR headsets, and a cable management puck for holding your VR headset or headphones. NZXT isn't doing anything crazy or bizarre here, though the addition of a cable management puck is both unique and thoughtful. It's a magnetic accessory, so if you don't like how it looks on the front of the case or find that the right-side panel offers more convenient access, you can move it around as desired. It also allows users to wind up cables, or it can be split apart for longer cable coverage. Cable management extends inside the case with interior clamps and cutouts, along with a steel bar that splits the front intake from the rest of the case. While we haven't played with an S340 Elite in person, it looks like it would be easy to hide cables behind the motherboard tray. As with the original S340, you can mount a pair of 2.5-inch SSDs on top of the PSU shroud. The S340 Elite also includes a third mounting option on the front of the PSU shroud, so if you have a drive that you want to show off behind the transparent tempered glass panel, you can do so here. There's also room for up to three 3.5-inch drives. Cooling is handled by a top 120mm fan and rear 120mm fan. There's room in the front to add two more 140mm or 120mm fans. If going the liquid cooling route, the case supports two 140mm or 120mm radiators up front and a single 120mm radiator in the rear. Whereas the original S340's front panel included a pair of USB 3.0 ports and an audio/mic combo port, the S340 Elite adds a pair of USB 2.0 ports to the mix, along with an HDMI port with VR support. You can pre-order the S340 Elite now for $100. NZXT estimates shipping will commence on November 9. Pricing in the U.K. has been set at £90 including VAT. UPDATE: The Matte Black version is available to purchase today; the Matte White and Red+Black versions are the ones up for pre-order and hitting "later this month."